Tom Adams is your guide to Friday morning's football headlines, with more success for Germany and a big-money move for Jermain Defoe. Must be nice to win the World Cup. Must be nice to have the option of sending your B-team to the Confederations Cup, confident in the knowledge they won't embarrass your country. Must be nice when said B-team tramples over Mexico 4-1 in the semi-finals and looks favourites to beat Chile in the final. Yep, must be nice to be German, and specifically Jogi Low. 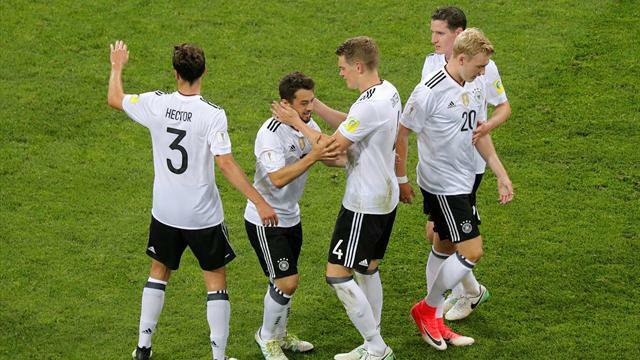 The only problem for the Germany boss will be the process of trying to whittle down a squad of 23 for next summer's World Cup, when Germany apparently have around 30-40 players worthy of tournament football. Of all the players to have impressed at the Confederations Cup, though, one stands clear: Leon Goretzka, who scored twice against Mexico and, at the age of 22, looks primed for a summer of heavy speculation about a move to Arsenal before an eventual transfer to Bayern Munich.
" It has been a testing ground and over the three weeks, we have developed a lot as a team. But this is not something we could pre-empt. Some have had no experience, no caps, so you couldn't calculate it. They are very ambitious and yearning to be part of the team. In the dressing-room, they are really happy, but they know there is a game to go and I am quite confident they can pull it off." " When the opportunity came about to return to AFC Bournemouth, I just knew it was the right one. It was an easy decision, joining a top team with a top manager. It’s a great place to be. The Bournemouth fans know that every time I pull the shirt on I will give 100%, and the one thing I can guarantee is goals." Defoe won't cost Bournemouth a penny, having exercised a release clause in his contract following Sunderland. Oh hang on, it says here they have given a 34-year-old a three-year contract with a big signing-on fee meaning Defoe, 34 and of three-year contract fame, is going to cost £20m - that's for a man who is 34 and will be given a three-year contract. On the other hand, he did score 15 league goals for last season for one of the worst teams in living memory and has resurrected his England career too. So maybe it isn't complete madness. Either way, that bizarre move to Toronto in 2014 seems a long time ago now. Taking time out from his busy Instagram schedule, Paul Pogba is making some back-page headlines (on a day otherwise largely dominated by Andy Murray's injury woes ahead of Wimbledon and something called the Lions) thanks to an interview he conducted with Esquire. The lost interesting snippet is probably the moment when he bristled at questions over Manchester United's playing style last season, delivering a response which could have come from the lips of Jose Mourinho himself.
" I accept that we didn’t play well, we didn’t do this, we didn’t do that. I know what we did – we won three trophies. That’s all I know. And that’s all that matters. Because you can be the best team in the world, you can play great football and you win zero trophies. And who remembers them? No one. Right?" We get Pogba's point here, but it doesn't really hold. Holland's Total Footballers, Hungary's Magnificent Magyars and, yes, Kevin Keegan's Entertainers are all good examples of how style can endure without silverware. Equally, there are legions of successful teams who have been instantly forgettable after lifting their trophy, or trophies. Firstly, we must commend the loyalty of Rangers fans, almost 50,000 of whom turned up to watch a Europa League qualifier against Progres Niederkorn of Luxembourg, only to see a narrow 1-0 win. That set a new European record. Bravo. And in a world where Donald Trump is still tweeting unhinged abuse of women, we can be excused a second dose of positivity. Well done to Zinedine Zidane, who decided to sell his son, Enzo, to Alaves yesterday, but not before he surprisingly named him in Real Madrid's Champions League final squad to face Juventus just so he could get his hands on the famous trophy. You will struggle to find a more brutally honest and introspective interview than that given by Steven Caulker to Dom Fifield at the Guardian, as the defender lays bare the personal torment he has been through.
" Sometimes I’d be sat there with the police and my lawyer, watching the CCTV footage of what I’d done, and I didn’t recognise myself. I couldn’t believe the person I was. It’s so hard to accept I could be like that. In Liverpool I was waking up in the middle of the night throwing up, people were blackmailing me, club owners and bouncers: ‘Pay money or we’ll sell this story on you.’ And I had no idea what I’d even done on those blackouts. I eventually told the club I couldn’t function and needed to go back into rehab." Apropos of literally nothing - honestly, there isn't even a sliver of relevancy to this at all - please find below the best assists and passes of Michael Laudrup. It's your glimpse into the future as Germany take on Spain in the European Under-21 Championship final. Our money's on the luxuriantly talented Spanish but *reaches for book of hoary old international cliches* you can never *dusts down parchment* rule out the Germans. We've had the Confederations Cup and Euro U21s to sustain us this past fortnight, but by Monday they will both be finished. Adam Hurrey returns to guide us through a bleak, bleak week.